SANFORD_ The Florida Department of Transportation’s pre-construction public meeting for Wekiva Parkway Section 8 on Nov. 15, 2018, drew 90 attendees. The project from Orange Boulevard to Rinehart Road will connect State Road (S.R.) 429 to Interstate 4 (I-4) and S.R. 417, thereby completing Central Florida’s beltway. Work also will include building about 24 bridges and the general use lanes for the future I-4 Beyond the Ultimate project. Attendees at the meeting at Lakeside United Methodist Church, 121 N. Henderson Lane, were able to view a multi-media presentation and speak directly with staff to get their questions answered and to express their concerns. Among the communities represented were: Tall Trees, Savannah Park, Berington Club, Wekiva River Oaks and Shadow Lake Woods. Question and comment topics included: Noise and sound walls; visibility and/or proximity of parkway; the height of bridges; saving trees in the floodplain compensation pond; fencing around the floodplain comp pond; landscaping; and, completion schedules for Section 8 and other sections. Among the officials attending were: Gary Huttmann, executive director of MetroPlan Orlando; Jean Jreij, Seminole County Utilities and Public Works Director; Matt Hassan, Seminole County Public Works and Bill Wharton, also with Seminole County. Preliminary activities for Section 8 have begun, including relocating gopher tortoises. The major construction is scheduled to begin in early 2019 and finish in late 2022. SANFORD _ The Florida Department of Transportation's Wekiva Parkway Section 7A pre-construction public meeting on Feb. 22 drew 184 people. This project involves building the elevated parkway along the State Road (S.R.) 46 corridor from near Longwood-Markham Road to Orange Boulevard, as well as parallel, non-tolled service roads for local trips. Attendees at the meeting at Lakeside United Methodist Church, 121 N. Henderson Lane in Sanford, submitted eight comment forms and 10 public involvement performance surveys. Comment topics included how to access the parkway, fencing, landscaping, concerns about road closures, noise and lane transitions at State Road (S.R.) 46 and International Parkway. Among the officials attending were Jean Jreij and Matt Hassan of Seminole County Public Works, Tony Matthews of Seminole County Planning, and a number of Seminole County Fire and Rescue personnel. Section 7A is scheduled to begin construction in April - May, and finish in spring-summer of 2022. SANFORD – The Wekiva Parkway Section 7B Design Update public workshop on January 30, 2018, was attended by 120 people in Seminole County. The Florida Department of Transportation (FDOT) held the meeting to review the latest design for these non-tolled road improvements. This project is funded for construction to begin in summer of 2019. The project limits are State Road (S.R.) 46 from Orange Boulevard to Wayside Drive-Oregon Street. This design project involves 1.31 miles of improvements, including roadway widening, safety medians, sidewalk, bike lanes, traffic signal upgrades, drainage, sign and pavement markings, utilities and other roadway features. The meeting was held at Lakeside Fellowship United Methodist Church, at its new location at 121 N. Henderson Lane in Sanford. In addition to Seminole County Public Works and Fire and Rescue officials, attendees included residents from neighborhoods including Terracina, Lake Forest, Astor Farms, Capri Cove and Terra Bella. Attendees were able to view exhibits and an audiovisual presentation, and to ask questions of project staff. A number of comments were submitted, dealing with right turn lanes, landscaping, signal timings and requests for fencing. Design on this project is expected to finish in late 2018. SORRENTO - About 170 people attended the Florida Department of Transportation’s Wekiva Parkway Section 6 pre-construction public meeting on September 28 at Camp Challenge in Sorrento. Among those in attendance were Jean Jreij, Matt Hassan and Eric Erickson of Seminole County Public Works, Donald Harkins of Seminole County Fire Rescue, and Barbara Howell of the Florida Department of Environmental Protection. Attendees at the open house were able to view exhibits and a multi-media presentation, and to get their questions and concerns addressed by agency project staff. There also were a number of questions about access to and from the non-tolled service road and connector roads, construction schedule and impacts, the removal of part of C.R. 46A. Many people were relieved to find out that they will still be able to go east and west along the parkway corridor using the service road without paying a toll. SORRENTO - Nearly 150 people attended the Wekiva Parkway Sections 3A and 3B pre-construction public information meeting held by the Florida Department of Transportation on August 24. The meeting features the latest construction plans and schedules, including exhibits explaining changes to traffic patterns in the work zone. The contractor, GLF Construction, expects to begin work in October. SORRENTO - The Florida Department of Transportation hosted 84 people on May 23, 2017, at the Wekiva Parkway Section 5 Pre-construction Public Information Workshop at Camp Challenge. Among those in attendance were George Gadiel, Lake County Engineering and Public Works; Gallus Quigley, Lake County Parks and Trails Division; Lt. Aldrich and a couple others with Lake County Fire and Rescue. Some community members expressed concerns about project impacts to entrances, proximity, noise and visibility. Many others were excited about the overall project and soon-to-be-improved access to SR 429. A number of people were interested in the parkway trail. Section 5 construction is scheduled to begin June 5. SANFORD - The Wekiva Parkway Section 7B Design Update Public Meeting hosted by the Florida Department of Transportation on May 16, 2017, was attended by 93 people. The meeting allowed community members to view the preliminary plans, to ask questions and express concerns about Section 7B, a non-tolled improvement project. Section 7B will finish the six laning of State Road 46 from Orange Boulevard to Oregon Street-Wayside Drive, as well as install drainage, sidewalks, bike lanes and landscaping. - Request for traffic signal at Center Rd. 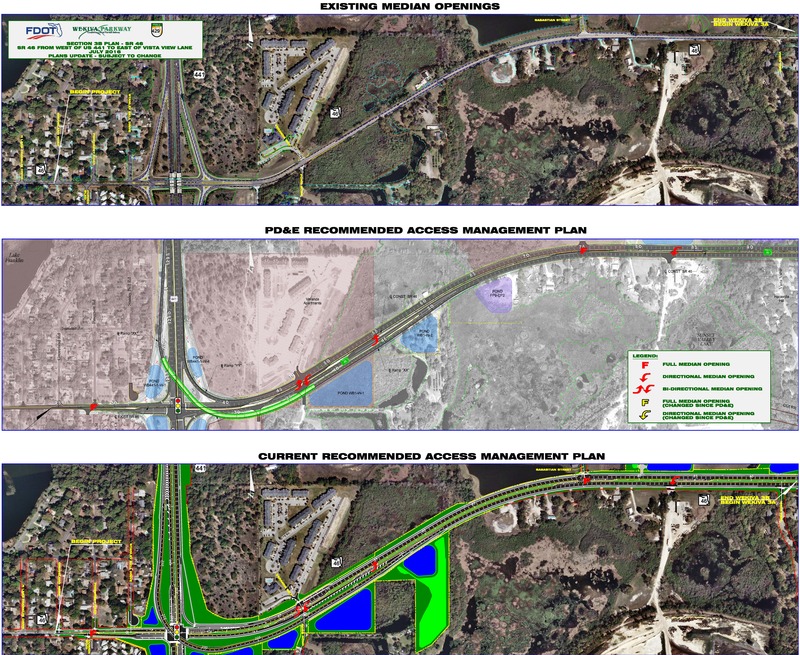 - Property impacts if SR 46 is widened west of Orange Blvd. - Request to keep the right turn lane currently at Lake Forest Blvd. Design of Section 7B began in December 2016 and is scheduled to finish in late 2018. Construction on Section 7B is scheduled to begin in the summer of 2019. SANFORD - The Florida Department of Transportation’s Wekiva Parkway Section 8 design public information meeting on March 21, 2017 was attended by 181 people. The open house was held at the Lakeside United Methodist Church in Sanford to review the latest preliminary design for the section that connects to I-4 and State Road 417, completing the beltway. Among the officials in attendance were Jean Jreij, Seminole County Public Works Director; Tony Nelson, also of Seminole County; and Hugh Harling of the East Central Florida Regional Planning Council. Attendees had questions and comments about noise, proximity, access, property values, possible damage to property from pile driving, speeding / speed limits, and height of parkway at various locations. Most everyone said they saw the need for the project, with some very anxious for it to be completed. Five people submitted comment forms and five others turned in public information performance evaluation surveys, with largely positive reviews. Documents and exhibits from the public meeting can be found below. MOUNT DORA _ More than 200 people attended the July 12, 2016 Access Management Public Hearing hosted by the Florida Department of Transportation for Wekiva Parkway Sections 3A, 3B and 5. The hearing _ which included an open house, a formal presentation and a public testimony period _ took place from 530 p.m. - 730 p.m. at the Mount Dora Community Center, 520 N. Baker Street in Mount Dora. Members of the public submitted 19 comment forms. Four people spoke during the public testimony period, and one person testified to the court reporter.The public comment period continues through July 26, 2016; information from the public during that time will become part of the hearing record. All comments will be responded to in writing. Among the officials attending the public hearing were: Mount Dora City Council members Cal Rolfson and Ed Rowlett, and former Mayor Jim Yatsuk; TJ Fish of the Lake Sumter MPO; Jim Stivender, Lake County Public Works Director; and, Morgan Hatfield from State Rep. Jennifer Sullivan's office. There were a number of repeated concerns, including noise and proximity issues, impacts to quality of life / property values, access management (having to make U-turns), removal of trees and impacts to wildlife, and impacts on local roads. Many other comments were positive, with folks saying the project is needed and will help them in their travels greatly. To view the public hearing photo gallery, click here. SANFORD _ Some 147 people signed in at the Florida Department of Transportation's March 29 preliminary design update meeting on Wekiva Parkway Section 8. Among those attending the meeting at the Lakeside United Methodist Church in Sanford were Seminole County Commissioner Lee Constantine, Acting Public Works Director Jean Jreij, Assistant County Engineer Shad Smith, and Bill Wharton and Tony Matthews of Seminole County Planning. Attendees were able to view the latest exhibit boards, a multi-media presentation, schedules and handouts, and get their questions answered by project staff. Section 8 entails building the parkway interchange connecting SR 429 with I-4 and SR 417, thereby completing the beltway around Central Florida. 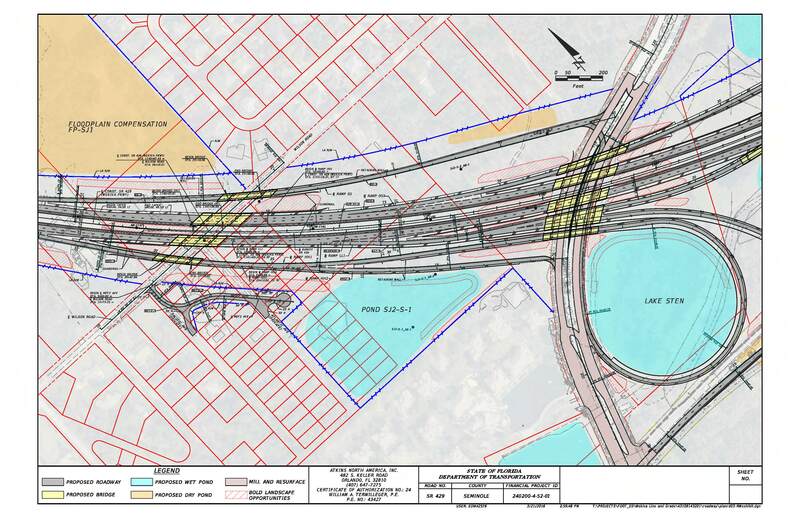 A number of changes were presented at the public meeting since the last update in 2013, including keeping the current SR 417 ramp connection to International Parkway. FDOT will be advertising for bids for this design-build project in January 2018. Construction on this section is scheduled to begin in October 2018 and finish in late 2021. APOPKA _ Some 158 people attended the Central Florida Expressway Authority's pre-construction Community Open House on Sept. 24, 2015 for the agency’s second section of the Wekiva Parkway (State Road 429). Sections 2A, 2B and 2C (429-204, -205 & -206) are to be built north of Kelly Park Road between Round Lake Road, Mount Plymouth Road (County Road 435) and State Road 46. Those attending the meeting at the Northwest Orange County Improvement Association (NOCIA) Building on Ponkan Road were able to view the latest project maps and aesthetics exhibits, and a narrated PowerPoint presentation. CFX and consultant design staff were on hand to answer questions on topics that included parkway elevations, access points, proximity and impacts to property owners, schedules and property acquisition. Among those attending were: City of Apopka Mayor Joe Kilsheimer and Commissioner Diane Velasquez, Lake County Engineer Fred Schneider, City of Apopka Community Development Director Jay Davoll and Senior Designer Vladimir Simonovski. Media coverage leading up to the meeting included The Orlando Sentinel, WFTV Ch. 9, WMFE and the Apopka Chief. To view the Open House photo gallery, click here. 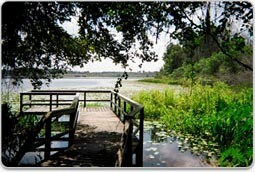 SORRENTO _ More than 156 people attended the second Wekiva Parkway Sections 5 and 6 Public Workshop on April 7, 2015, at Camp Challenge. Five people submitted comment forms at the Florida Department of Transportation meeting, meant to update the community on the Section 5 100 percent and the Section 6, 60 percent design plans. Among the officials that attended were Lake County Engineer Fred Schneider; Hugh Harling of the East Central Florida Regional Planning Council; Robert Brooks, Wekiwa Springs State Park Manager; Joe Bishop, Seminole State Forest Supervisor with the Florida Forestry Service and David Martin of Seminole County. Former Lake County Commissioner Catherine Hanson and members of the Friends of the Wekiva River also were in attendance. The mood was overwhelmingly positive. Many attendees were pleased to know that they will have the option of using non-tolled, parallel service roads for local trips in east Lake and Seminole Counties. This was the second design public workshop held for these sections. Design is scheduled to finish this year. Construction is scheduled to take place from 2017-2020. To view photos from the meeting, click here. Seminole County – More than 213 people attended the Florida Department of Transportation (FDOT) public information meeting on Feb. 17, 2015, about the Wekiva Parkway Section 7A in Seminole County. Attendees reviewed exhibits illustrating the 60 percent design plans, viewed a narrated PowerPoint presentation and got their questions and concerns addressed by project staff members. The project is funded for construction in 2017. The Section 7A project limits are on State Road (SR) 46 from east of River Oaks Circle to Orange Boulevard. The project consists of designing 3.53 miles of limited access toll road along the SR 46 corridor, parallel, non-tolled, frontage roads for local travel, bridges and roundabouts at intersections under the parkway for enhanced safety. Attendees submitted 11 comment forms, and seven (7) public meeting performance evaluation surveys. APOPKA _ Nearly 130 people attended the Central Florida Expressway Authority's pre-construction Community Open House on Sept. 25, 2014 for the agency’s first section of the Wekiva Parkway (State Road 429). Sections 1A and 1B (429-202 & 429-203) are to be built from near US Highway 441 near Plymouth Sorrento Road to north of Kelly Park Road. Those attending the meeting at Apopka High School were able to view a drive-through animation of construction of the first two sections, the latest project maps and aesthetics exhibits, and a narrated PowerPoint presentation. CFX and consultant design staff were on hand to answer questions on topics that included parkway elevations, access points, proximity and impacts to property owners, as well as adjacent sidestreet and other improvement needs. Among those attending were: Orange County Commissioner Fred Brummer; City of Apopka Engineer and Community Development Director Jay Davoll, Public Services Director John Jreij and Senior Designer Vladimir Simonovski; Lake County Public Works Director Jim Stivender; Seminole County Manager - Office of Organizational Development Steve Fussell (County Manager's Office); Hugh Harling, Executive Director of the East Central Florida Regional Planning Council; Wekiva River Basin State Parks Manager Robert Brooks; and, Brian and Linda Burns of the Orange County Public School District. Citizens submitted several comment forms, including via an electronic comment form station. Mount Dora _ More than 111 people attended the Florida Department of Transportation's public meeting open house on June 24, 2014 to view the latest design plans for Wekiva Parkway Sections 3A and 3B. This was the second public workshop during design for the non-tolled sections stretching from US 441 and SR 46 to east of Round Lake Road. Among the notables attending were Mount Dora City Manager Mike Quinn and Councilman Nick Girone. The meeting at the Mount Dora Community Center also drew extensive media coverage. The two project sections are working towards 90 percent design in late summer. Construction of both sections is scheduled from 2017-2019. The Section 3A project limits are on State Road (SR) 46 from east of Vista View Lane to east of Round Lake Road. The project consists of designing the widening and other non-tolled improvements to 1.4 miles of SR 46 and Round Lake Road. 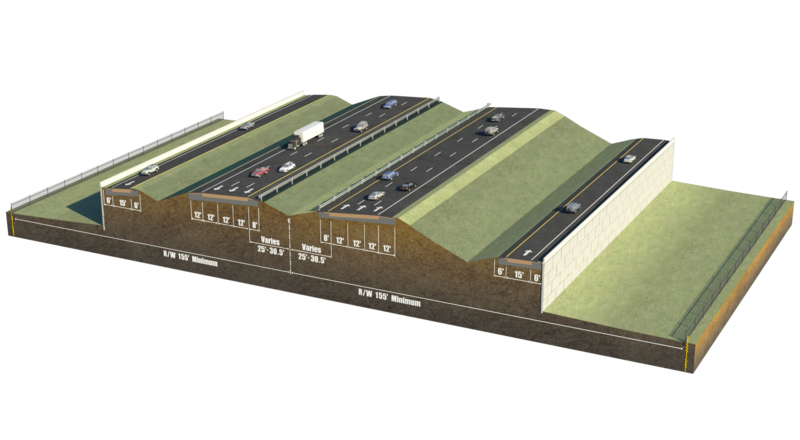 The Section 3B project consists of designing the US 441 flyover interchange at SR 46, as well as road widening and other non-tolled improvements along SR 46 from west of US 441 to east of Vista View Lane in Mount Dora. Lake County - More than 220 people attended a public meeting open house on April 29, 2014 conducted by the Florida Department of Transportation (FDOT) to review the latest preliminary design plans for Wekiva Parkway Sections 5 & 6 in Lake County and a small portion of Seminole County. The meeting at Camp Challenge, 31600 Camp Challenge Road in Sorrento, also resulted in 13 people submitting written comments. The project is funded for construction in 2017. Among those attending were property owners, realtors, attorneys, environmental advocates, and local officials including Mike Wood of the Lake-Sumter MPO, Lake County Public Works Director Jim Stivender and Lake County Engineer Fred Schneider. Media coverage of the public meeting included the Orlando Sentinel and CFN13. 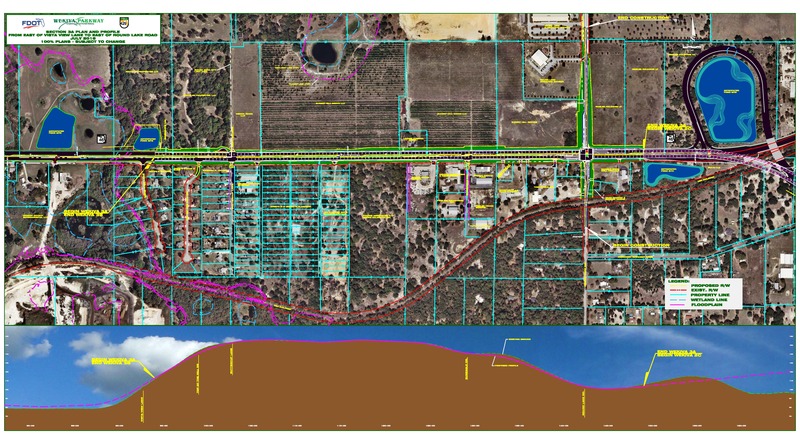 The Section 5 project is to design the non-tolled relocation of County Road (CR) 46A out of the Seminole State Forest, thereby improving habitat connectivity and reducing the risk of conflicts between vehicles and wildlife. CR 46A would be realigned 2.5 miles from north of Arundel Way to connect to State Road (SR) 429 east of Camp Challenge Road. 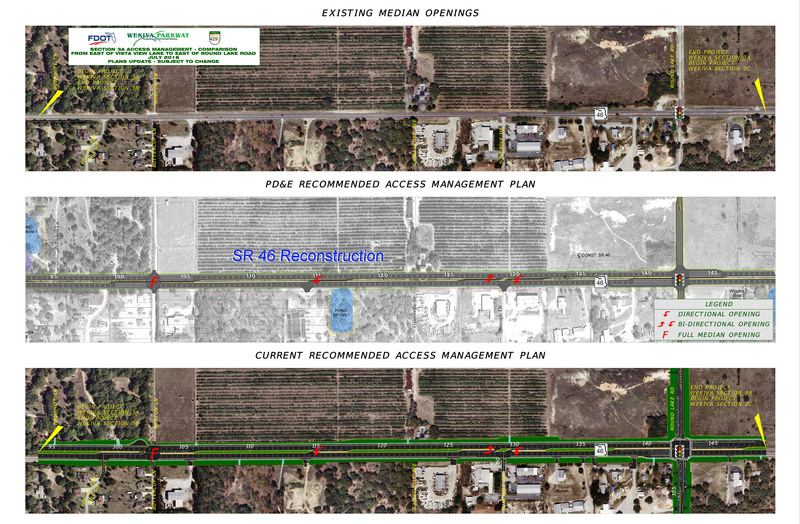 The Section 6 project is to design 5.5 miles of limited access toll road largely along the existing SR 46 corridor from west of Old MacDonald Road to east of Wekiva Park Road. 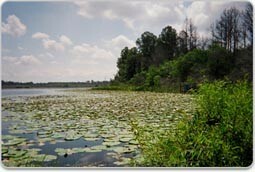 The project will include designing a non-tolled, service road for local travel and a new bridge over the Wekiva River. 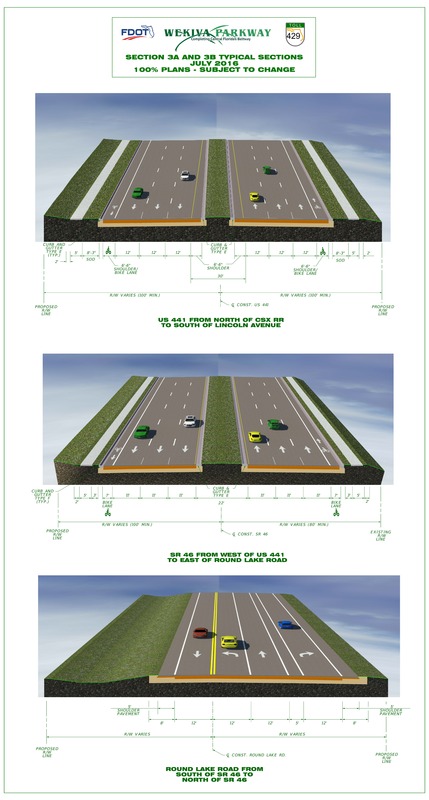 This section also will feature several wildlife bridges to allow animals to pass safely between the Seminole State Forest and Rock Springs Run State Reserve, as well as a multi-use path. Seminole County – More than 212 people attended the Florida Department of Transportation (FDOT) public information meeting held November 12, 2013 about the Wekiva Parkway Section 7A in Seminole County. The informal open house was held at The Rock Church in Sanford to review the latest preliminary design plans, including proposed intersection safety enhancements, to allow citizens to ask questions of project staff and to submit comments.. The project is funded for construction in 2017. The Section 7A project limits are on State Road (SR) 46 from east of Wekiva River Road to Orange Boulevard. The project consists of designing 3.53 miles of limited access toll road along the SR 46 corridor and parallel, non-tolled, frontage roads for local travel. 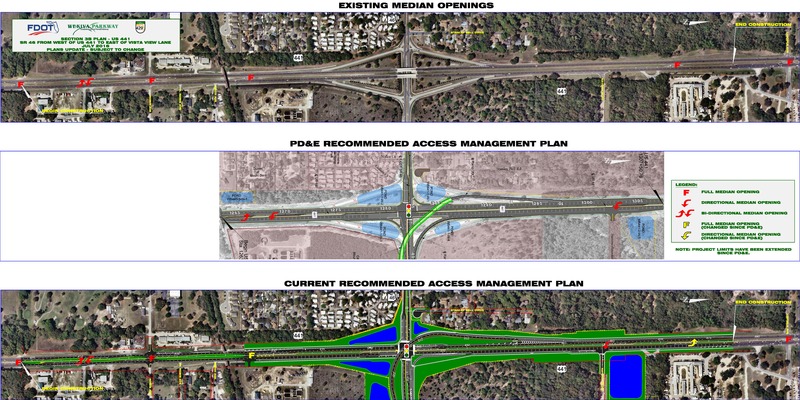 (ORLANDO, FL) – More than 170 people attended a community open-house meeting on Nov. 7, 2013 for the Expressway Authority's second section of the Wekiva Parkway, to be located north of Kelly Park Road between Round Lake Road and Mt. Plymouth Road (County Road 435). In addition to the many property owners and other interested parties, among those in attendance were Jonathan Till, District Secretary to State Representative Bryan Nelson, Lake County Engineer Fred Schneider, Brian Sanders of Orange County Transportation Planning, Jay Davoll, City of Apopka Engineer and Community Development Director and Town of Eatonville Councilman Alvin Moore. The meeting was held at the Northwest Orange County Improvement Association (NOCIA) building at 4253 W. Ponkan Road, Apopka, FL 32712. Attendees were able to view maps, drawings and other pertinent information about the latest design plans for these sections, ask questions of project team members and submit their comments. The three projects, totaling 5 miles, will feature all electronic tolling and a multi-level, systems interchange northwest of Haas Road-Ondich Road and Plymouth Sorrento Road. Construction on these projects, estimated at a total of $150 million, is scheduled to begin in 2017 and finish in 2019. Photos and exhibits from the public meeting can be viewed below. Lake County – More than 150 people attended the public information meeting about the Wekiva Parkway Section 3A and Section 3B on July 11, 2013 at the Mount Dora Community Center. Citizens and officials attending the informal open house were able to review the latest preliminary design plans, watch an audiovisual presentation, ask questions of project staff and submit comments. Some 20 people submitted comment forms at the meeting. The two project sections, which will not be tolled, will be built together and are funded for construction in 2017. The Section 3A project limits are on State Road (SR) 46 from east of Vista View Lane to east of Round Lake Road. The project consists of designing the widening and other non-tolled improvements to 1.4 miles of SR 46 and Round Lake Road. 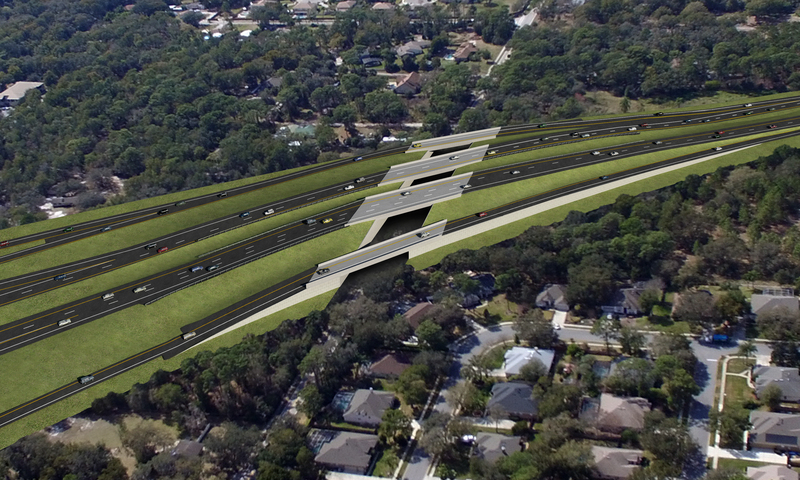 The Section 3B project consists of designing the US 441 flyover interchange at SR 46, as well as road widening and other non-tolled improvements along SR 46 from west of US 441 to east of Vista View Lane in Mount Dora. To view photos from the public meeting, click here. More than 180 people attended a Florida Department of Transportation public meeting to review preliminary plans for Wekiva Parkway Section 8 on June 11, 2013. Those attending the meeting at The Rock Church, 6641 W. SR 46 in Sanford, were able to view project exhibits, plans, a PowerPoint presentation and to ask questions of FDOT and other project team staff. Nearly 20 people submitted comments as a result of the meeting. The meeting was held to allow the public to review and comment on the Section 8 15% Line and Grade Design. Section 8 includes the parkway interchange with I-4 and SR 417. The preliminary design includes some changes from the Project Development and Environmental (PD&E) Study. Project team staff will be responding to the comments. To see photos from the meeting, click here. Nearly 200 people attended a community open-house meeting that the Orlando-Orange County Expressway Authority held March 21, 2013, on its first section of the Wekiva Parkway from north of US 441 near Plymouth Sorrento Road to just north of Kelly Park Road. Those attending the meeting at Apopka High School included agency and elected officials, property owners, interested members of the public and the media. Meeting attendees were able to review maps, drawings and other pertinent information about the 60% complete design plans for this project, as well as ask questions of agency and project staff. To view a photo gallery from the meeting, please click here.